There's a portion of the American population that sticks to the mantra: "Guns don't kill people. People kill people." Well, Free Fire tosses together a bunch of different types of people and crates full of guns into a confined space, and a lot of shooting and killing happens regardless of who's behind the artillery and pulling the trigger. Does that support any side of the argument, or both? That matters about as much as the story itself matters within Ben Wheatley's latest pure action guilty pleasure ... that's to say, not much at all, really. Encased in a dilapidated factory with tons of jagged hiding spaces, an eclectic group of largely untrained criminals and renegades are thrown into a firefight after a large arms deal goes south, propelled by rapid humor and off-the-wall violence that's stimulating while caught in the crossfire. One the dust settles, however, there isn't much worth taking away from Wheatley's one-location shootout, leaving in its wake only the shallowness of its amusing characters and the vain foolishness of the whole endeavor. With the darkness of night surrounding their Boston meeting space, a group of loosely-connected individuals gradually come together into two sides of a significant transaction involving a whole lot of guns. One faction, which can be loosely interpreted as the "good guys", features members of the Irish Republican Army hoping to obtain weapons for their cause, led by Frank (Michael Smiley) and Chris (Cilian Murphy). The other side makes up the arms suppliers, introduced by Ord (Armie Hammer) and led by free-wheeling Vernon (Sharlto Copley). A beautiful, self-composed blonde woman, Justine (Brie Larson), serves as a liaison between the two factions, though her allegiance seems to tilt more toward the buyers than the sellers. Clashing personalities, twisted details of the deal, and some recognition between members of the opposing groups create a tense atmosphere that eventually spirals out of control, resulting in a chaotic gunfight between the two with the money and the guns themselves there for the claiming. Free Fire kicks off with two henchman driving to that meet-up spot, one -- something of a "pretty boy" (Sam Riley) -- covered in blood and complaining about the beating he received the night before due to his womanizing pursuits, which flips into a nonsensical quip about a "reluctant panda bear" through his thick Boston accent. Co-writing the script alongside his longtime collaborator Amy Jump, director Wheatley makes it clear that this will be the kind of amplified characterization that'll fill the ranks of both squads, sporting overstated dialogue that aims for clear laughs instead of realistic chatter. They become clearly-drawn, muted caricatures with observable traits that confirm how they'll react and perform once their hands get on firearms, and very few of ‘em stand out as noteworthy performances within the superficial boundaries of the characters, whether it's the innate charisma of Cilian Murphy and Brie Larson in largely straight roles or the bloated shenanigans of Sharlto Copley's fiery and unfiltered South African machismo. One exception is Armie Hammer, whose suave and tongue-in-cheek persona forms a distinct, retro character who's far more intriguing than the rest. The circumstances that start the shootout in Free Fire are too clumsy and unthinking to take seriously, though, hinged on doubtful small-world circumstances and a shoddy choice of henchman on both sides of the table. This becomes the point when Wheatley's film veers away from being a credible guns-blazing actioner to a comedy with an action-oriented foundation, something a little closer in attitude to Shane Black's The Nice Guys than, perhaps, the versatile works of one of the film's executive producers, Martin Scorsese. Free Fire also doesn't have any deeper intentions to fall back on, unlike Wheatley's equally exaggerated but more conceptual High-Rise; no socioeconomic commentary and fondness for source material are to be found in the dusty layout of this danger zone of a factory. Instead, it becomes abundantly clear that co-writers Wheatley and Amy Jump wanted to create an unpredictable environment where everyone could feasibly shoot at everyone, and they'll all jokingly spar with one another while waiting for an open shot. Once the first piece of artillery gets drawn and the trigger pulled, Free Fire begins its plummet into jubilant mayhem, escalating quickly and anxiously once the two sides are pushed over their limits. Shoddy aiming, ricocheting bullets, and a lack of clarity over where they landed -- and in whom they've landed -- combine with the flippant attitude emphasized in Wheatley and Jump's scripted dialogue, and suddenly the lack of taking itself seriously starts to pay off. It's pretty clear that none of these people have been trained to handle guns with James Bond or John Wick-caliber precision, so their endless missed bullets are justified alongside the accidental, darkly humorous bedlam that it all produces. The humor never eases up from its exaggerated tempo, as if those caught in the fray know they're playing to an audience watching them awkwardly try to kill one another, but the playfulness and adaptability of the dialogue lands more than a few hilarious hits throughout. That said, Free Fire's deliberately hectic action and constant verbal zingers end up being a double-edged sword once the numbers start thinning out on both sides. As Ben Wheatley relishes the incremental landed shots and odd-and-end methods that inch the participants closer to death, it also loses its grip on making the audience give a damn about who's going to get out of the situation alive. That leaves this elaborate showdown -- which gets exponentially unrulier with explosions, fires, and active cars driving about -- in a state of constant anticipation of the next goofy line and/or lucky shot instead of building one's investment toward the stakes and outcome, something that doesn't really change from the moment that the whole thing blows out of proportion. 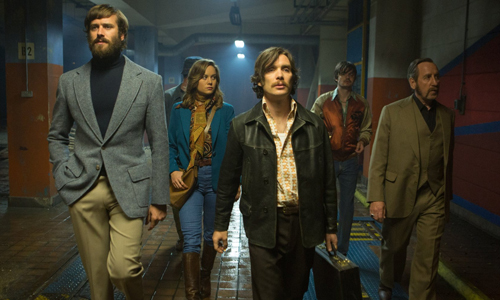 Despite a few grisly surprises and predictable twists involving the person responsible for making this bad situation even worse, there isn't much that develops throughout Free Fire beyond its raucous bodycount and a pile of one-liners at their feet, kneecapping its potential as a standout genre pic. That doesn't stop it from being something of a blast, though.